Exploring the megatrends, best new innovations and next practices … Smarter technology, innovative brands and courageous leadership … Big ideas for German business leaders in the year ahead. More change in the next 10 years, than in the last 250 years … Connected technologies, augmented intelligence, and possibilities limited only by our imaginations. Elon Musk says we live in a time of profound progress – accelerated by his Tesla cars, SpaceX rockets and Hyperloop tubes, he hopes. Ray Kurzweil beckons us towards his point of singularity, an exponential journey where man fuses with machine. Alibaba’s Jack Ma, who went from English teacher to $480bn CEO, simply says he’s having the best party ever. But it doesn’t always feel exciting. Complexity and change can often challenge our established ways of thinking, the frame in which we see our world, and the choices we make. Technologies can be intimidating too. It’s easy to feel inadequate if you can’t precisely explain your artificial intelligence from your augmented reality, bitcoins from blockchains, or petabytes and gigabytes (a million times different). But it is the application of all this to the real world – to human beings, customer experiences, and to economic and social progress – that matters. That requires foresight and imagination. So don’t be afraid, we can all be part of this journey. Beer for punks: Brewdog has grown from Scottish start-up to billion-dollar brand. Boom. Dubai Air Show saw the launch of a “new Concorde” aircraft, featuring the iconic delta wing and able to fly at Mach 2.2. In collaboration with Virgin, Boom Technology is on schedule to launch this year, bringing back memories of when I could breakfast in LHR, and again in JFK 3 hours later. Brewdog. The Scottish craft beer entrepreneurs became a $1 billion-valued “unicorn” in 2017, partly through consumer crowdfunding, aka “Equity for Punks”. Known for its provocative marketing, and strong ales, it opened a brewery in Ohio, and plans a DogHotel with bedside DogTap if thirsty. ThyssenKrupp. What if elevators could move sideways, instead of just up and down? Inspired by Charlie and the Chocolate factory, the steel maker has launched the Multi, replacing the old up and down pulley systems with magnetic levitation, up and across the walls of buildings. Toutiao. The Beijing start-up was 2017’s most successful new unicorn, valued at $20bn. It is a content recommendation platform, using AI to analyse content, plus users and their interactions, from which algorithm models generate a personalised feed list of content for each user. So where do we start in making sense of this changing world? To seize this huge disruption as fabulous opportunities to work smarter and get an edge, innovate and grow, we need to understand the drivers of change. These power the “mega trends” that are shaping our markets and minds, and the more practical advances that we can directly and creatively embrace. Pattern recognition is one of the key skills in being able to develop foresight, to gain a better view of your changing markets, and therefore an advantage over competitors. “Trends” emerging patterns of change likely to impact how we live and work. Megatrends are large, social, economic, political, environmental or technological change that are slow to form, but once in place can influence a wide range of activities, processes and perceptions, possibly for decades. They are the underlying forces that drive trends. Many of the trends are familiar to us all. Shift in global economic power, with commodity prices driving some emerging markets into recession. Democratic and social change, with more people living longer, more aspiration and fewer children. Rapid urbanisation, in particular through the explosion of lesser-known, medium-size, emerging-market cities like Hyderabad or Shenzen. Climate change and resource scarcity. And, of course, technological breakthroughs. Underneath these mega trends are the more interesting shifts, and in particular the “fringe” behaviours of radical thinkers and early adaptors, which could become the mainstream of future years. Newness typically emerges from the edges. 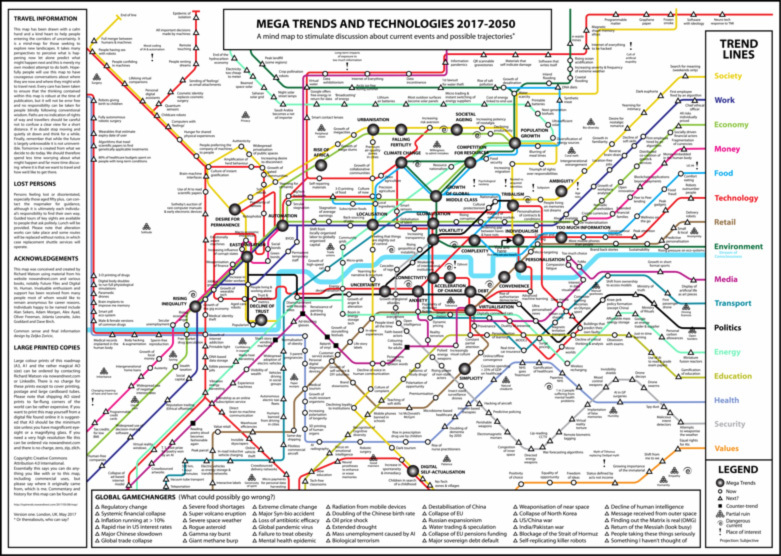 One of the most impactful annual trend presentations comes from Richard Watson, who seeks to map short and long-term trends (from the centre of the diagram outwards). He also focuses on the intersections, points where trends have more disruptive impact – and equally the bigger opportunities for innovation and growth. Wonka vision: ThyssenKrupp’s magnetic levitation multi-directional elevator. So where are the most significant waves of change, right now? Pattern recognition: Richard Watson’s map illustrates trends and intersections. New business models … exploring new revenues streams, new price models, new value equations. What will be most disruptive? How will we win differently? Positive impact … embracing a sustainable circular economy, that shares value responsibly. Satya Nedella, CEO of Microsoft, recognised the need to think differently within the business he inherited from Bill Gates and Steve Ballmer. His new book “Hit Refresh” is a manifesto for seeing our old challenges, assumptions and prejudices, in new ways. By taking a different perspective, often inspired by small companies and marginal operators, he sought fresh ways of working inside Microsoft, and new solutions for personal and business customers. Social business: Adidas and Ocean Clean Up, making designer shoes from plastic waste. What should be clear, is that our world, our markets and customers, have become increasingly polarised. A new set of tensions – or paradoxes – have emerged. From Brexit to climate change, Trump to the Catalans, we see challenges to our stability and progress that were not even imagined a few years ago. How will you embrace these 7 paradoxes? Global v local … big or small, international or provincial, centralised or decentralised, homogeneous or heterogeneous, institutional or individual, standardised or crafted … Or instead, how can we get the best of both worlds – like Amazon’s Treasure Truck bringing unplanned surprises to local neighbourhoods, from global platform, to local people? Human v technological … digital or physical, robotic or human, artificial or authentic, transparent or private, ideas or algorithms, fast or slow, interfaces or experiences … Or instead, how can we combine the two to do better – like Dalian Wanda, China’s answer to Disney, with a new generation of multi-media, entertainment-based shopping malls. Individual v collective … individuals or communities, transactional or relational, producing or co-creating, enterprises or ecosystems, competing or collaborating, protected or open sourced … Or instead, how to achieve both, like Supreme, the hip-hot skater brands that uses pop-up marketing driven with incredible hype by social-media, driving a millennial after-market in fashion? Business v society … purpose or profit, shareholders or society, responsible or reckless, transparent or untrusted, diversity or division … Or how can we find a new balance, like Adidas’ Parley running shoes made from recycled sea waste plastics in collaboration with Ocean Clean Up from the Netherlands, then sold as ultra cool and twice the normal price? Change v continuity … innovate or optimise, growth or efficiency, flexible or stable, experimental or perfection, change mindset or fixed mindset … Or instead, how to connect the two dynamics, like GE which seeks continuous revolution with its FastWorks innovation process, connecting design thinking and lean development to experiment and reduce time to market by 90%? Simplicity v complexity … linear or networked, corporate or entrepreneurial, planning or hacking, creator or adapter, analytic or intuitive … Or instead, how to embrace both, like the world’s largest white company Haier, which uses a “rendanheyi” business model, built on thousands of micro-businesses within one organisation, entrepreneurial and focused? Tomorrow v today … tactical or strategic, incremental or transformational, safety or risk, boldness or parity, tangible or intangible, sales revenue or future profits … Or instead, how to drive radical change whilst delivering everyday, like the “today tomorrow” model embraced by Jeff Bezos in driving 25 years of relentless growth? The biggest challenge for leaders today, is to resolve these paradoxes, to align the opposing forces or apparent contradictions. The biggest opportunity for leaders is to find ways to achieve both – which means reframing the context, and rethinking solutions. Third ways, new ways, better ways. Increasingly it is new technologies that enable these new ways. Take blockchain, for example, offering the ability to “democratise” markets and brands, through local engagement and decision making. Or 3d printing, through mass customised production on demand. Or neuroprosthetics, enabling artificial limbs to work as well as real body parts. Or AI-based scanners and trackers making more accurate and predictive medical diagnosis. The applications of technology can redefine our possibilities, and our choices. Conceptual thinking, and cool start-ups are great. But what is the reality for most of us? I spend much of my time travelling, advising and inspiring business people around the world through projects, workshops and keynote events. I get to meet the most fascinating companies and innovators. Some are big famous corporates like P&G, or luxury icons like Cartier, or cool brands like Red Bull, but others are smaller, more niche and more intriguing companies. I usually learn more from the latter. Woman and machine: David Hansen’s humanoid robot Sophia became a Saudi citizen. Hong Kong. David Hansen claims that he brings robots to life. His human-like, smiling and joking, creation called Sophie became the world’s first robot citizen during the launch of Neom, Saudi Arabia’s $500bn future metropolis, human and robotic, 33 times larger than New York City. What I take from these experiences is that the sensationalist phrase I started with – more change in the next 10 years, than last 250 – is very real, and happening right now. Across every sector, in emerging and developed markets, digital and analogue, companies big and small are shaking up our world. Millennial marketing: Supreme, in collaboration with brands like Louis Vuitton. Make digital and physical work together … In 2018, the real world fights back. Don’t see them separately. Digital is the enabler of more human experiences – more personal and sensory, more immersive and collaborative. Images, touch and voice are no longer bound by a screen, and can be dispersed more physically – creating more convenience and support where it matters most. Airbnb is far more than a booking engine, but a way to explore new places and feel you belong there. Rebuild trust with transparency … In 2018, it’s hard to know what is genuine, where things come from, and who to trust. Rachel Botsman’s new book Who Can You Trust? explores how technology together, but might drive us apart. Blockchain is one potential way of resolving the crisis, an example being FollowMyVote which allows secure, anonymous voting. In embracing such new approaches, brands will need to move from touch points to trust points. Engage customers in their context … in 2018, stop thinking that you are the centre of the world, instead engage customers in their context, more relevant and more valuable. Austrian plastics innovator Greiner stopped talking about yogurt pots, and instead how to help customers like Nestle to innovate with more healthy foods on the go. The best places to sell downloadable music? In the gym, where most people listen to it. Embrace automation and algorithms … In 2018, its time to make big data work for you. Marketing is ever more personal and predictive. Netflix and Spotify have transformed what we watch and listen to, through their algorithmic recommendations. Finery tracks your clothes purchases to become you “wardrobe operating system”, whilst Digit allows you to outsource your finances, ensuring you can the best return on investments or spare cash. Focus on the points of influence … In 2018, the point of sale will finally decline in importance, challenging sales people everywhere to rethink. People are inspired and influenced by each other – their ideas and experiences – rather than celebrities or salespeople. Community-based platforms like Glossier become powerful, building an active community through relevant content and collaboration – a beauty brand in itself, as well as new type of channel for other relevant brands. Become the thought leader … in 2018, ideas will matter more. Fast-emerging technologies need new thinking. Customers need insights and inspiration about what to do, rather than just products and services to implement. They want new perspective and next practices, to stimulate their thinking, and to do better. Creative ideas, research projects, white papers, education, case studies. These are far better ways to assert your competitive advantage, and to engage customers more deeply. Create big brand moments … in 2018, brands become participative. Nike’s Sub 2 initiative caught the imagination of sports enthusiasts around the globe. Could a human break 2 hours for the marathon? The debate climaxed in Monza with a perfectly-staged event, that resulted in Eliud Kipchoge running 3 mins faster than anyone in history (but 35 seconds adrift of his target). Millions watched and cheered him through a Twitter livestream, and later bought his Zoom Fly shoes. Solve the problem, don’t just sell the product … in 2018, its time to help people do more. For too long, we’ve been eager to make the sale, and maybe offer a little “after sales” support. For customers, this is where their value begins. So the best brands, are all about helping people to use the products better, to achieve what they want to do. This might be through DIY workshops to help people use their new tools, or coaching clinics to help people run faster in their new kit. Think communities not buyers … In 2018, business will finally realise that consumers want to engage with each other, rather than brands. Get over your obsession for relationships. Instead enable customers to connect with others like themselves – engaging, sharing, creating. With shared purpose they gain a voice, and become a movement. Rapha, with its Cycle Clubs full of lycra-clad cycling enthusiasts drinking coffee, as well as buying the premium clothing, is a great example. Reinvent your business model … in 2018, business models are ripe for innovation. Rethinking how your business works is more urgent, and more possible. Engaging partners to do what you do better, maybe share the risk and reward. Developing new revenue streams by charging for additional services, or maybe a subscription model. Loftium created a fabulous new model for first time buyers, offering to pay the upfront deposit in return for a share of ongoing spare bedroom Airbnb earnings. Innovate for people and profit … in 2018, social businesses will grow rapidly. Solving a real problem in society, and making money, is a great motivator for innovation. Consumers will engage more deeply with brands that demonstrate a conscience. Solben is a great example, a bio-energy company founded 8 years ago by 16 year-old Mexican entrepreneur Daniel Gomez Iniguez, and now the largest in Latin America. Tesla, now with a higher market cap than Ford, builds on this too. Don’t be afraid of the digital mesh … in 2018, digital technologies fuse together. People, devices, content and services. AI is the glue that connects it all in relevant, dynamic and autonomous ways. Platforms enable this fusion, the technology becoming invisible, whilst the applications are multiplied. Alibaba’s City Brain project is about a connected, intelligent approach to smoothing traffic, encouraging shopping and reducing crime in Chinese cities. Make the network multipliers work for you … in 2018, networks grow exponentially in value. Each new participant adding many more connections. Social networks, distribution networks, franchises and communities are all networks. The secret is to make their connectivity become more valuable – the content shared between people, the benefits of omnichannel in a multi-locational brand. Don’t see your networks as a passive database, but as active participation. Intelligent personalisation is the norm … in 2018, customisation used is no longer a luxury, it is expected. But with intelligent processes and 3d printing, anything can be created instantly, and on demand. Adidas Speedfactory has transformed demand for designer trainers, a completely new AI-based product produces, whilst Local Motors will co-create the car of your dreams within 28 days, and Habit is a DNA diagnostic-based nutrition plan created just for you. Connect with brand bots … in 2018, Amazon’s Alexa or Tencent’s Xinowei have become our new automated shopping friends, creating a new “their place” between digital and physical retail. But this also threatens the influence of brands, as machines make choices, often biased by owners. Domino’s teamed up with Alexa to make pizza ordering fast, fun and friendly, whilst Sephora created its own chatbot, Kik, to help beauty consumers choose the right products, and to use them better too. Immerse yourself in a fantasy world … in 2018, dreams can become reality. Virtual reality (VR) and reality have combined as augmented reality (AR) enabling digital technologies to enhance physical experiences. But this requires imagination too, bringing interactive games or fictional stories to life. Pokemon Go was a fad, but also a tipping point in game design. Game of Thrones could be your next vacation, or just stay at Disney’s new Star Wars Hotel. Be human, quirky and surprising … in 2018, people want to smile more. Cut through the automation and sameness of convergent innovation, to do something different. Amazon’s Treasure Trucks are a fun way to take single-item discounting to local communities, announced on social media and the arriving “with the ringing bells of the old ice-cream van” to create a sense of local carnival, and taking time to meet, talk and listen to customers. Envision the future, and deliver today … in 2018, the old strategy process doesn’t work. 10, 5 or 3 year planning frames are too inflexible. Instead we need roadmaps to the future which give us direction, enabled by smart choices, but we also need to adapt and evolve with constant change. Scott Anthony’s book Dual Transformation is a great manual, Facebook rethinks every 6 months, and Google redefines strategy as growth hacking. By seeing a better future, you will deliver better today. Beyond the sale: Rapha’s cycle clubs engage people in their passions. The best leaders have the courage to shape the future, rather than just live by the norms of today … to think bigger and smarter … to rethink, refocus and reinvent. The best opportunities for business – to find new growth, to engage customers more deeply, to stand out from the crowd, to improve their profitability – are found by seizing the opportunities of changing markets. The best way to seize these changes is by innovating – not just innovating the product, or even the business itself – but by innovating the market. In the old world we accepted markets as a given – the status quo – and competed within them, with slightly different products and services, or most usually by competing on price. Most new products are quickly imitated, leading to declining margins and commoditisation. Most companies now recognise that this is no longer a route to long-term success in a rapidly changing world. Leaders need more courage. Opportunities are limitless, competition is intense and ideas need to be bigger. Judgement is the hardest part – making the right decisions, for today and tomorrow. Making better choices that embrace the new context, resolve the apparent tensions, and propel on our exciting journey.